This week in Raw when Seth was in Rollins Ring, Ambrose came to the big screen and first said that he did not want to answer anything but for some time he told that he did this because of Shield. Dean Ambrose said that he thought that he was powerful with Shield but Shield always weakened him, he always lived behind the rest of the members. This is the reason why they broke the shield this time. Besides, Dean Ambrose also burned Shield's West. Seeing that Sath got very angry and he went backstage. Let us tell you that West was a special identity of Shield, which Dean has now ruined. The only problem with Monday Night Raw is that the show lasted 3 hours. Many of the big movies that make up the years in making them are not too big. It is very difficult to show a good show every week for 3 hours. This week's Monday Night Raw was good and fans liked it, but the fans were much more pleased with what happened at the end of the show. It must be assumed that this week WWE has done better things than useless things. 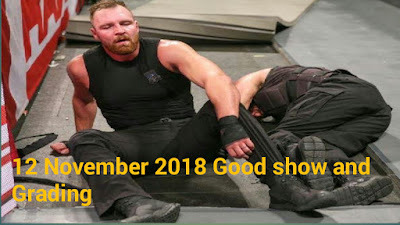 This week, for the first 2 hours of the show, there was not so much excitement for the Survivor Series but after seeing what had happened at the end, every fan will be eager for the Survivor Series. Becky Lynch is currently the best wrestler of WWE. At one time, the fences in the Attias era were much more eager, but in today's time, it is not so. However, whenever Becky Lynch arrives in this ring, the fans are very much happy and the presence of people like the Attitude Era starts to feel. In the entire Arena, the chances of Becky's name began to occur, when he stepped into the ring. Seeing what happened this week, it looks like Becky has proven herself as WWE's top superstar. While attacking Beckie, she suffered a slight injury, which caused bleeding from her nose, but despite all this, she did not notice any less than anyone. This week, Rhonda also did her work quite well. When Lynch locked them in the submission move, then Ronda did a pretty good act. Seeing all this, it seemed like all this is real.